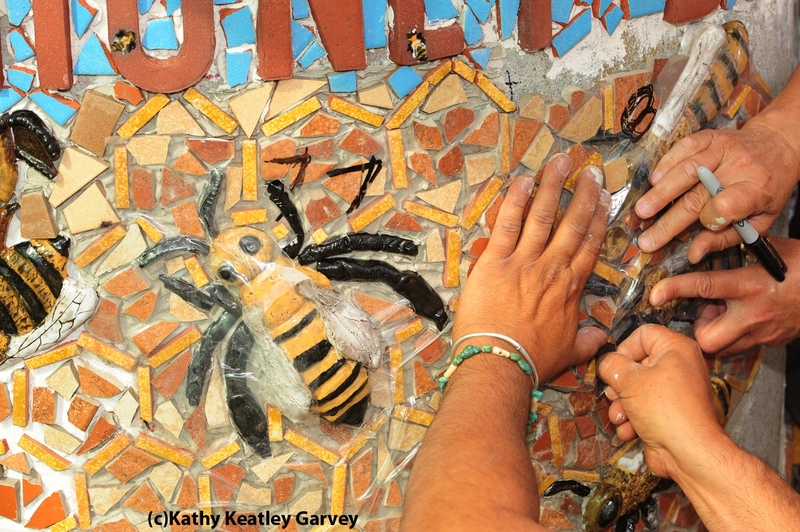 It’s all about the bees, the garden and the art. 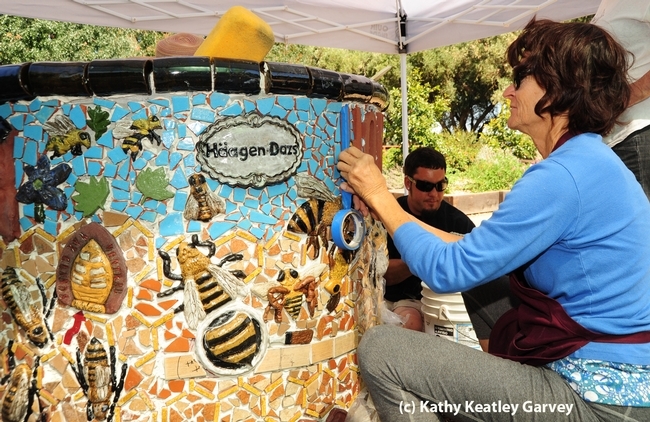 The UC Davis Art/Science Fusion Program is installing mosaic ceramic panels on cement planters at the Häagen-Dazs Honey Bee Haven, a half-acre bee friendly garden on Bee Biology Road, west of the UC Davis central campus. 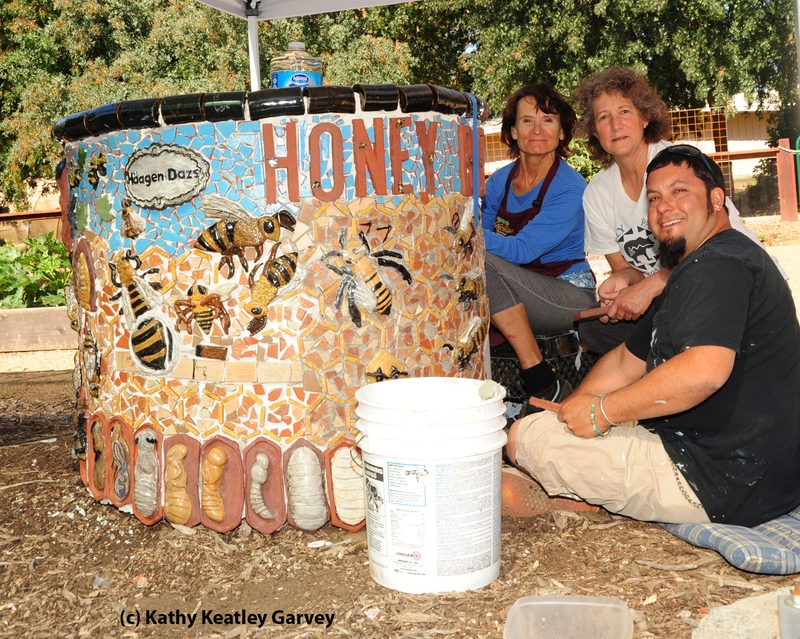 Diane Ullman and Donna Billick, co-founders and co-directors of the UC Davis Art/Science Fusion Program and their associate, professional mosaic ceramic artist Mark Rivera of Davis, began installing the work, titled “Life in the Hive,” on Thursday, May 30. The newest addition joins two other mosaic ceramic-paneled plants. 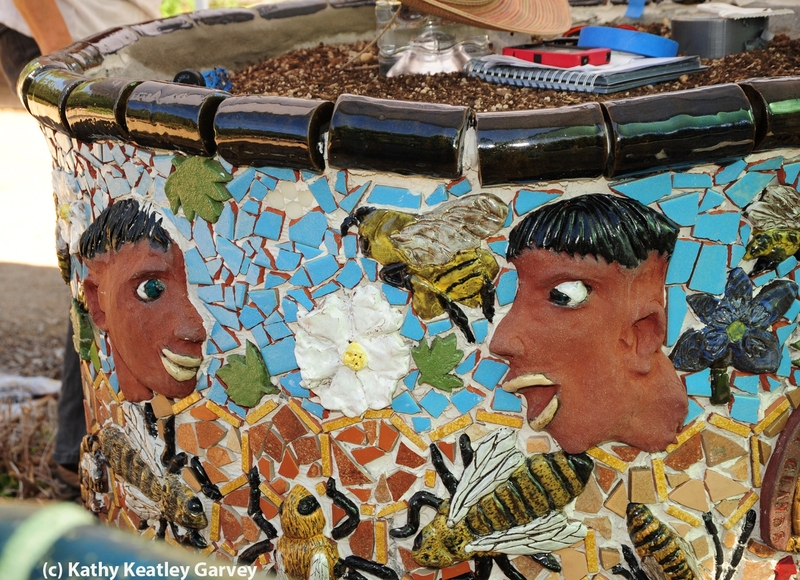 One showcases honey bees and bee friendly gardening, and the other focuses on plants and alternative pollinators, such as butterflies, bumble bees, carpenter bees, blue orchard bees, and metallic green sweat bees. Students in the Entomology 1 class, taught by Diane Ullman, associate dean in the UC Davis College of Agricultural and Environmental Sciences and professor of entomology, and self-described “rock artist” Donna Billick, created the panels on all three of the once-barren cement planters. 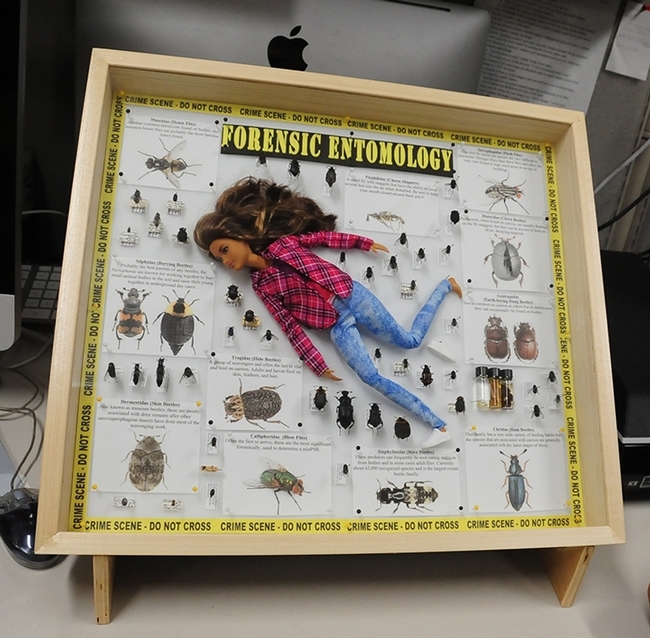 The latest addition, “Life in the Hive,” is the work of the spring-quarter Entomology 1 class. 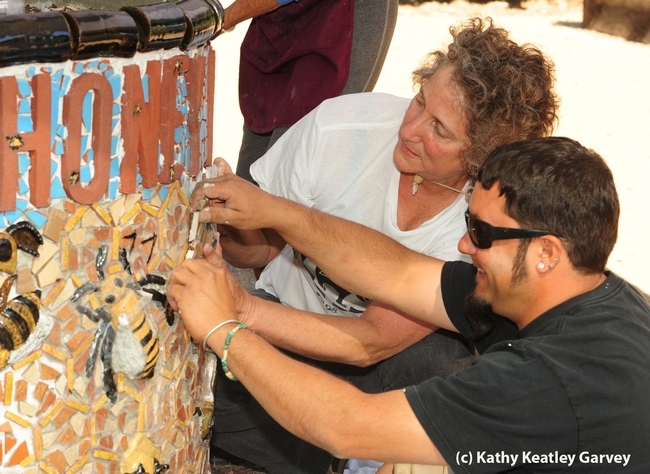 The students will gather in the haven on Saturday, June 1, to complete the installation. They will then discuss their work at a special event from 6 to 8 p.m., Tuesday, June 4 in the haven. “Life in the Hive,” lettered with “Honey Bee Haven” and “Häagen Dazs,” depicts the life cycle of the worker bee, queen bee, and drone. 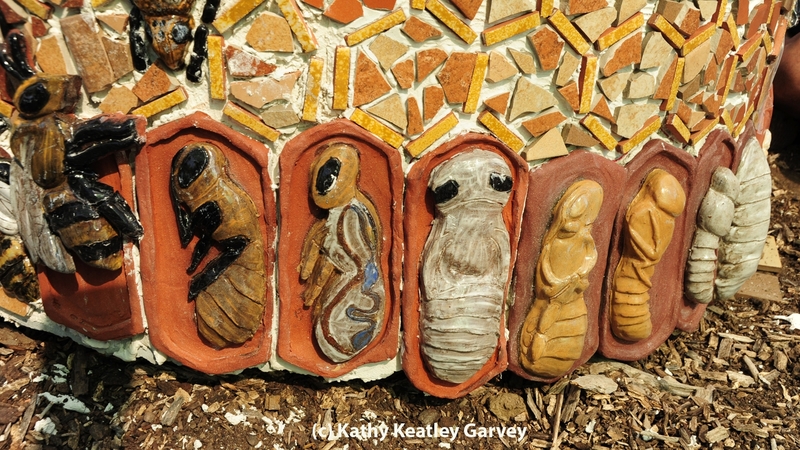 It also features a waggle dance, the queen bee and her retinue, and a newly emerged queen bee stinging and killing a competing queen ready to emerge from a cell. The art also depicts nurse bees, undertakers and foragers. Another panel shows a “before” and “after” person: "before" when he was deathly frightened of bees, and "after," when he developed an appreciation for them. 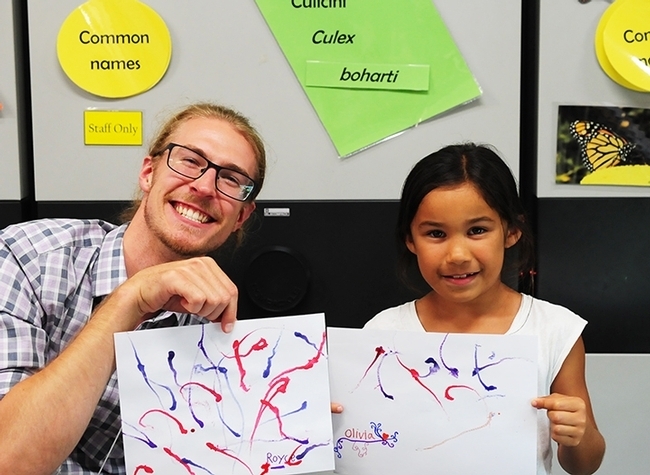 The UC Davis Art/Science Fusion Program, launched in 1997, helps students reach across disciplines to learn science through art, and art through science, Ullman said. 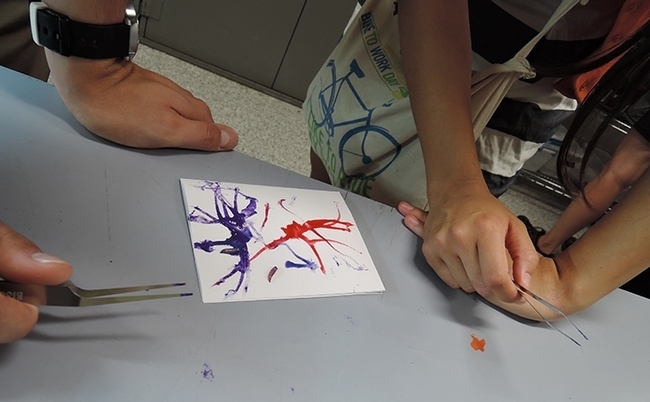 Each course focuses on key areas of biology, physics or environmental science and expressive art media, including ceramics, graphics, textiles, photography, poetry and music. The haven is a year-around food source for bees and other pollinators and is designed to (1) raise public awareness about the plight of bees, and (2) to show visitors what they can plant in their own gardens. Part of the UC Davis Department of Entomology, it is located just a few yards from the Harry H. Laidlaw Jr. Honey Bee Research Facility. The garden is open to the public from dawn to dusk for self-guided tours. For guided tours (nominal fee involved), the contact person is Christine Casey at cacasey@ucdavis.edu. If you think that every insect on a flower is a honey bee, you should see what the UC Davis Department of Entomology is showcasing at the Dixon May Fair, May 9-12. You'll not only see honey bees in a bee observation hive, but specimens of bumble bees, cuckoo bees, carpenter bees, long-horned bees, squash bees, plasterer bees, mining bees, leafcutter bees, wool carder bees and sweat bees. The exhibit is in the Southard Floriculture Building on the May Fair grounds, located at 655 S. First St., Dixon. 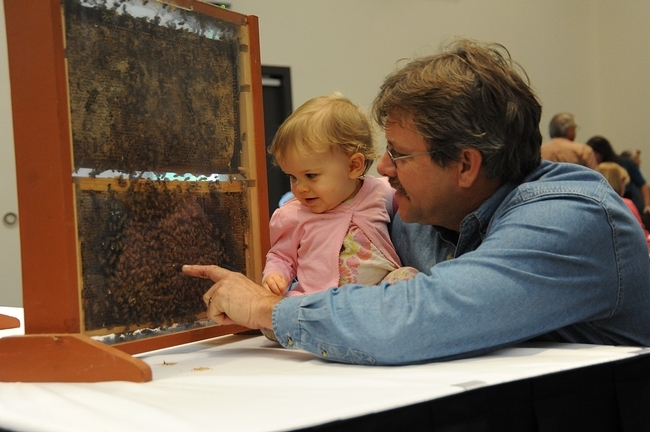 Participating are the Harry H. Laidlaw Jr. Honey Bee Research Facility and the Bohart Museum of Entomology, both part of the UC Davis Department of Entomology; and the newly formed UC Davis Honey and Pollination Center, headquartered at the Robert Mondavi Institute for Wine and Food Science. Beekeeper Brian Fishback of Wilton, owner of BD Ranch and Apiary and a volunteer at the Laidlaw facility for several years, is providing the bee observation hive, a glassed-in box that enables viewers to observe the activity that goes on inside a bee hive. Fishback, a past president of the Sacramento Area Beekeepers' Association and member of the California State Beekeepers' Association, is an educator as well as a beekeeper. He speaks about bees at schools, organizations and festivals. His daughter, Emily, 2, accompanies him on many of his talks. UC Davis graduate students, including squash bee expert Katharina Ullmann and area beekeepers (among them Jesse Loren of Winters and Lindsay Weaver of Sacramento) will be available during part of the fair (weekend) to share their experiences with fairgoers. 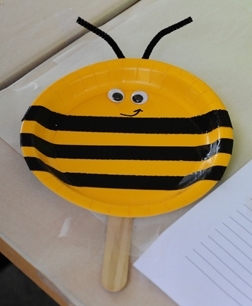 Children attending the Dixon May Fair on Mother's Day, Sunday, May 12 can make a "Honey Bee on a Stick," an arts and crafts project that doubles as a hand-held fan and puppet. 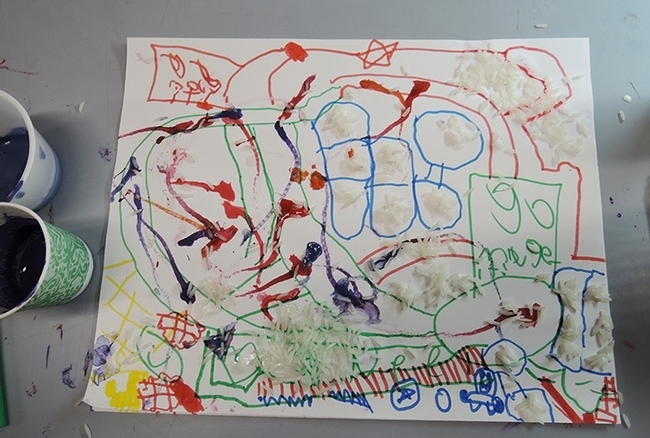 Executive director Amina Harris of the Honey and Pollination Center, an area beekeeper and a former school teacher, will help the children create the take-home art. 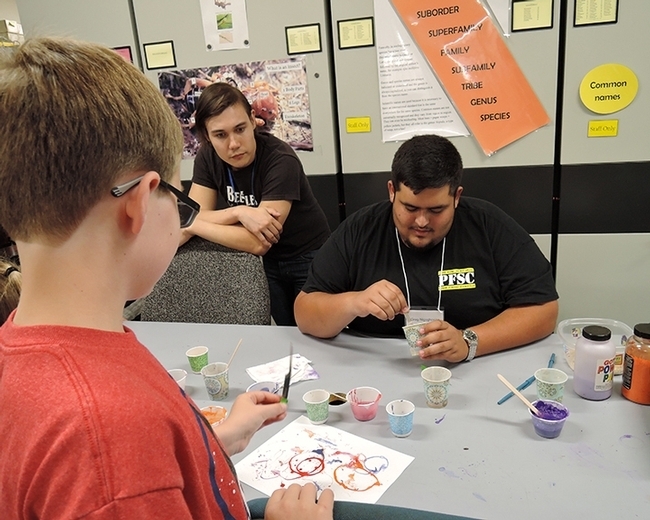 The free activity is from from 1 to 3 p.m. in the Southard Floriculture Building. 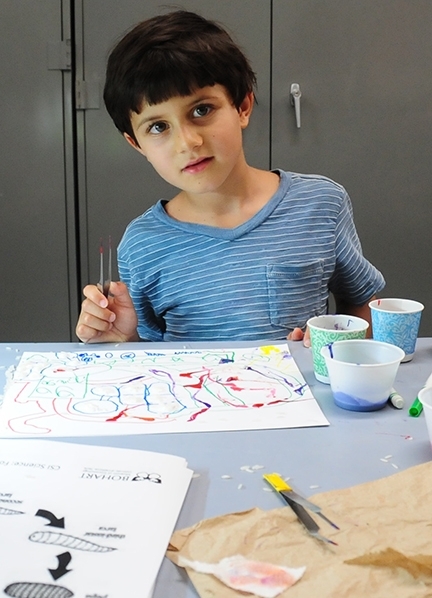 Harris crafts the bee art using a yellow paper plate, duct tape, googly eyes, a stick, and pipe cleaners (for antennae). The Dixon May Fair's floriculture building, staffed by superintendent Kathy Hicks of Dixon, includes stunning garden displays and a myriad of plants and cut flowers. It is open from 4 to 10 p.m. on Thursday, and from 10 a.m. to 10 p.m., Friday, Saturday and Sunday. 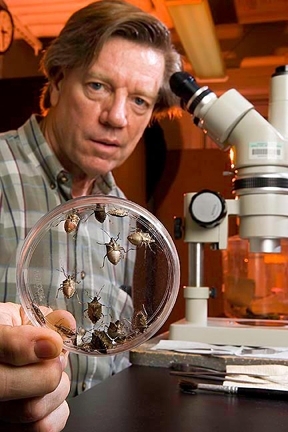 Jeffrey Aldrich and brown marmorated stink bugs. It doesn't usually make the 6 o'clock news--or even the 10 o'clock news--but it's trouble. 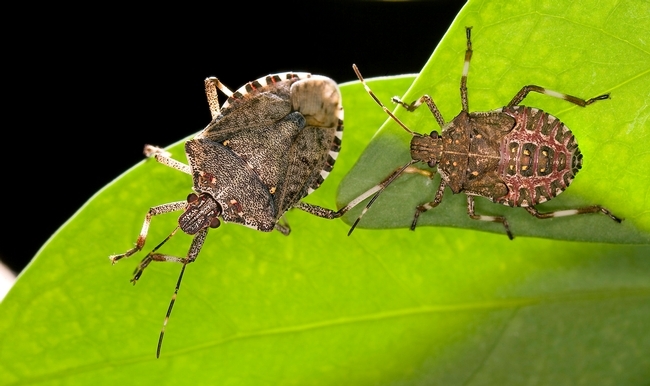 The brown marmorated stink bug (Halyomorpha hales), a native of Asia, was first discovered in the United States in Allentown, Penn., in 2000. Since then, it's been making a big stink. Literally. It's a major agricultural threat that feeds on vegetables and fruit, says UC Davis associate entomologist/chemical entomologist Jeffrey Aldrich. USDA has estimated $21 billion worth of crops are at risk. This includes apples, peaches, tomatoes, grapes, cotton, corn, green peppers, soybeans and other crops. Aldrich also calls it a "pervasive residential nuisance." 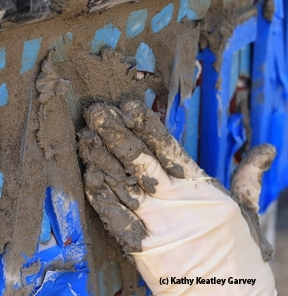 It may select your home as its wintering site, creating an infestation. That prompted The New York Times to declare "Move Over Bedbugs: Stink Bugs Have Landed." 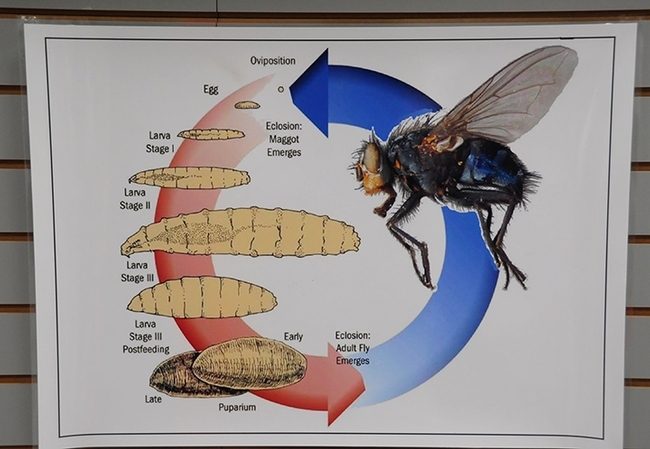 Aldrich will discuss the insect's invasion and its semiochemistry at the UC Davis Department of Entomology seminar on Wednesday, May 1, from 12:05 to 1 p.m. in Room 1022 of the Life Sciences Addition, corner of Hutchison and Kleiber Hall drives. Professor Frank Zalom and Ph.D candidate Kelly Hamby of the Zalom lab are the hosts. Aldrich will describe the history of the discovery; its subsequent spread across the country; and also detail the discovery of the bug's chemical communication system and ongoing pheromone commercialization efforts. He then will present results of laboratory experiments using native egg parasitoids exposed to the stink bug eggs. An expert on BMSB, Aldrich established that the insect in the U.S. is cross-attracted to the pheromone of a congeneric species; he facilitated commercialization of this cross-attractant lure; and he led the team that identified the pheromone of the BMSB. The research is potentially useful in systems to mass trap and/or attract-and-kill BMSB. 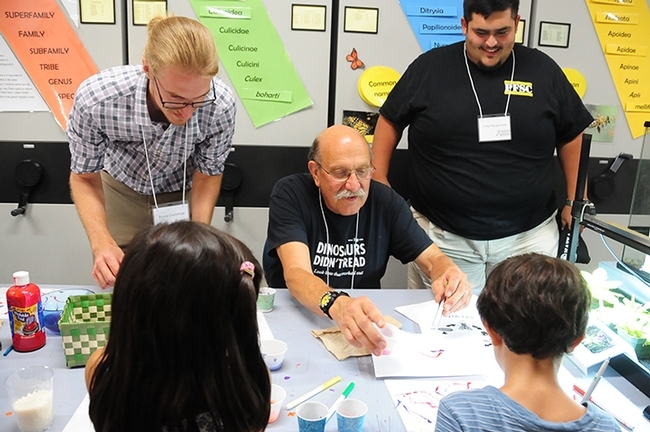 Aldrich's 40-year career on insect chemical ecology has taken him to Brazil, Australia, Japan and Italy. He served as a research entomologist for the U.S. Department of Agricultural Research Service, Beltsville, MD, from 1980 to 2011, including five years as a laboratory research leader (1999-2004). His work has been published in such journals as Science, Journal of Chemical Ecology, Chemoecology, and Environmental Entomology. He also travels around the nation and world, presenting lectures at technical organizations, universities, government agencies, and to lay groups. The New York Times, Washington Post, Baltimore Sun, Discovery, U.S. News and World Report, and Organic Gardener have interviewed him about his work. In addition, he's been interviewed by a number of radio and TV stations in the United States and Brazil. The May 1 seminar should be a real eye-opener about a major agricultural pest that continues to invade the United States. If you miss the seminar, plans call for video-recording the seminar for later posting on UCTV Seminars website. Where's the best spot for the new residents of my garden? I acquired two ladybugs last Saturday during the 99th annual UC Davis Picnic Day. 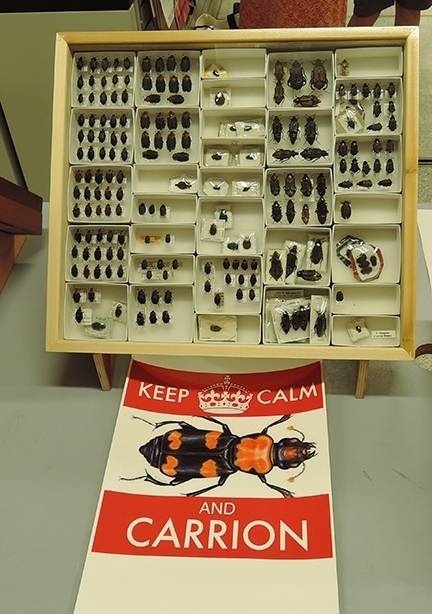 Background: as part of the campuswide celebration, the Department of Entomology annually hosts an all-out bugfest at the Bohart Museum of Entomology and at Briggs Hall. And keeping with the Briggs Hall tradition, the UC Statewide Integrated Pest Management Program gifted picnickers with the treasured ladybugs. 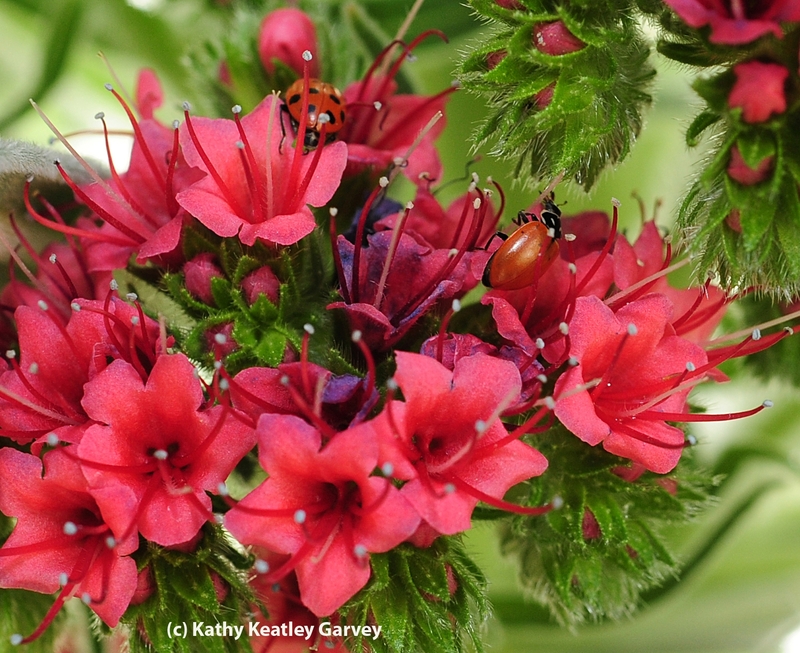 A ladybug is a good beneficial insect. It can devour an estimated 5000 aphids in its lifetime (three to six weeks). So, every year for the past several years, I've adopted two ladybugs, chauffered them home, and tucked them in our garden. "Please eat the aphids," I tell them. They're good at following instructions. Last year they took up residence in a bed of red roses. This year, they're coming up in the world--a high rise. 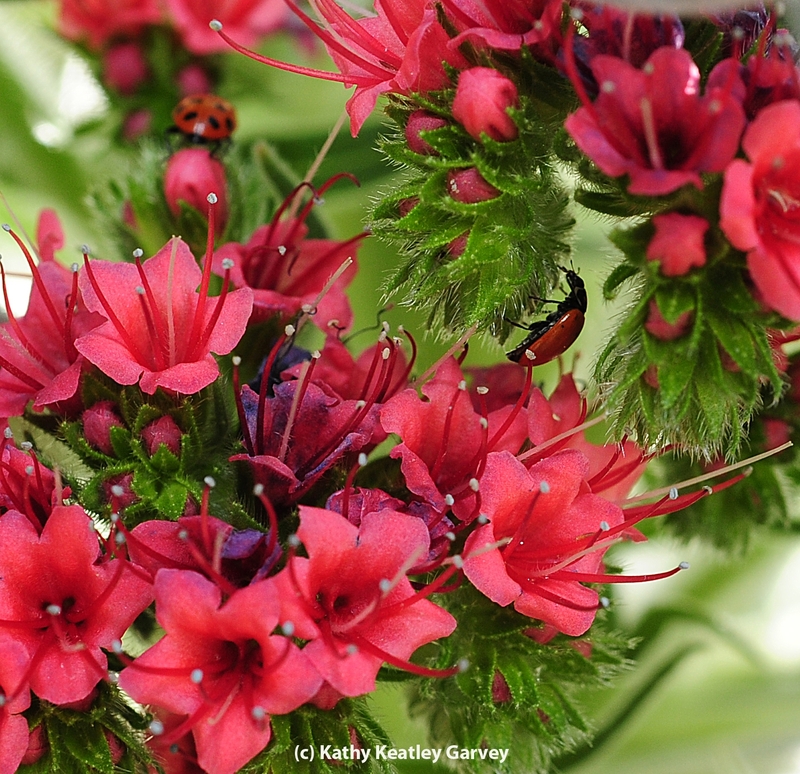 A tower of jewels (Echium wildpretii) is "home sweet home." 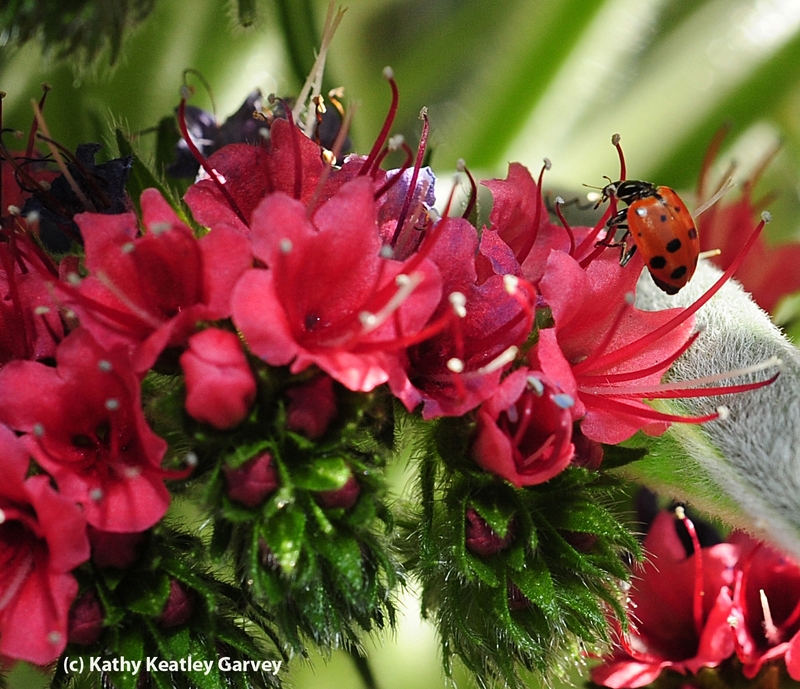 Life doesn't get any better than this if you're a ladybug (and any worse if you're an aphid).